For the New Zealand rock band, see The Datsuns. Datsun is an automobile brand owned by Nissan. Datsun's original production run began in 1931. From 1958 to 1986, only vehicles exported by Nissan were identified as Datsun. By 1986 Nissan had phased out the Datsun name, but re-launched it in 2013 as the brand for low-cost vehicles manufactured for emerging markets. In 1931, Dat Motorcar Co. chose to name its new small car "Datson", a name which indicated the new car's smaller size when compared to the DAT's larger vehicle already in production. 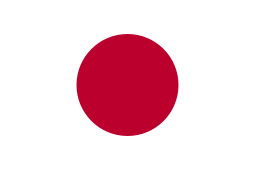 When Nissan took control of DAT in 1934, the name "Datson" was changed to "Datsun", because "son" also means "loss" (損 Son) in Japanese and also to honor the sun depicted in the national flag. Nissan phased out the Datsun brand in March 1986. The Datsun name is most famous for the 510, Fairlady roadsters, and later the Fairlady (240Z) coupes. Meitarō Takeuchi (竹内 明太郎, Takeuchi Meitarō). The DAT corporation had been selling full size cars to Japanese consumers under the DAT name since 1914. In 1930, the Japanese government created a ministerial ordinance that allowed cars with engines up to 500 cc to be driven without a license. DAT Automobile Manufacturing began development of a line of 495 cc cars to sell in this new market segment, calling the new small cars "Datson" – meaning "Son of DAT". The name was changed to "Datsun" two years later in 1933. The first prototype Datson was completed in the summer of 1931. The production vehicle was called the Datson Type 10, and "approximately ten" of these cars were sold in 1931. They sold around 150 cars in 1932, now calling the model the Datson Type 11. In 1933, government rules were revised to permit 750 cc (46 cu in) engines, and Datsun increased the displacement of their microcar engine to the maximum allowed. These larger displacement cars were called Type 12s. By 1935, the company had established a true production line, following the example of Ford, and were producing a car closely resembling the Austin 7. There is evidence that six of these early Datsuns were exported to New Zealand in 1936, a market they then re-entered in May 1962. After Japan went to war with China in 1937, passenger car production was restricted, so by 1938, Datsun's Yokohama plant concentrated on building trucks for the Imperial Japanese Army. When the Pacific War ended, Datsun would turn to providing trucks for the Occupation forces. This lasted until car production resumed in 1947. As before the war, Datsun closely patterned their cars on contemporary Austin products: postwar, the Devon and Somerset were selected. Not until 1955 did Datsun offer an indigenous design. 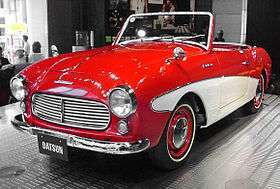 That year, the Occupation returned production facilities to Japanese control, and Datsun introduced the 110 saloon and the 110-based 120 pickup. The "classic" Datsun logo, based on the Flag of Japan and Japan's nickname as the "Land of the Rising Sun". After the Nissan rebrand, the logo remained the same, with "Datsun" replaced by "Nissan". The use of the Datsun name in the American market derives from the name Nissan used for its production cars. In fact, the cars produced by Nissan already used the Datsun brand name, a successful brand in Japan since 1932, long before World War II. Before the entry into the American market in 1958, Nissan did not produce cars under the Nissan brand name, but only trucks. Their in-house-designed cars were always branded as Datsuns. Hence, for Nissan executives it would be only natural to use such a successful name when exporting models to the United States. Only in the 1960s did Datsun begin to brand some automobile models as Nissans, and these were limited to their high-end models, for example the Cedric luxury-type sedan. The Japanese market Z-car (sold as the Fairlady Z) also had Nissan badging. In America, the Nissan branch was named "Nissan Motor Corporation in U.S.A.", and chartered on September 28, 1960, in California, but the small cars the firm exported to America were still named Datsun. Corporate choice favored Datsun, so as to distance the parent factory Nissan’s association by Americans with Japanese military manufacture. In fact Nissan's involvement in Japan's military industries was substantial. The company's car production at the Yokohama plant shifted towards military needs just a few years after the first passenger cars rolled off the assembly line, on April 11, 1935. By 1939 Nissan's operations had moved to Manchuria, then under Japanese occupation, where its founder and President, Yoshisuke Ayukawa, established the Manchurian Motor Company to manufacture military trucks. Ayukawa, a well-connected and aggressive risk taker, also made himself a principal partner of the Japanese Colonial Government of Manchukuo. Ultimately, Nissan Heavy Industries emerged near the end of the war as an important player in Japan’s war machinery. After the war ended, Soviet Union seized all of Nissan’s Manchuria assets, while the Occupation Forces made use of over half of the Yokohama plant. General MacArthur had Ayukawa imprisoned for 21 months as a war criminal. After release he was forbidden from returning to any corporate or public office until 1951. He was never allowed back into Nissan, which returned to passenger car manufacture in 1947 and to its original name of Nissan Motor Company Ltd. in 1949. American service personnel in their teens or early twenties during the Second World War would be in prime car-buying age by 1960, if only to find an economical small second car for their growing family needs. Yutaka Katayama (Mr. "K"), former president of Nissan's American operations, would have had his personal wartime experiences in mind supporting the name Datsun. Katayama's visit to Nissan’s Manchuria truck factory in 1939 made him realise the appalling conditions of the assembly lines, leading him to abandon the firm. In 1945, near the end of the war, Katayama was ordered to return to the Manchurian plant, however he rebuffed these calls and refused to return. Katayama desired to build and sell passenger cars to people, not to the military; for him, the name "Datsun" had survived the war with its purity intact, not "Nissan". This obviously led Katayama to have problems with the corporate management. The discouragement felt by Katayama as regards his prospects at Nissan, led to his going on the verge of resigning, when Datsun’s 1958 Australian Mobilgas victories vaulted him, as leader of the winning Datsun teams, to national prominence in a Japan bent on regaining international status. The company's first product to be exported around the world was the 113, with a proprietary 25 hp (19 kW; 25 PS) 850 cc (52 cu in) four-cylinder engine. Datsun entered the American market in 1958, with sales in California. By 1959, the company had dealers across the U.S. and began selling the 310 (known as Bluebird domestically). From 1962 to 1969 the Nissan Patrol utility vehicle was sold in the United States (as a competitor to the Toyota Land Cruiser J40 series), making it the only Nissan-badged product sold in the USA prior to that name's introduction worldwide decades later. From 1960 on, exports and production continued to grow. A new plant was built at Oppama, south of Yokohama; it opened in 1962. The next year, Bluebird sales first topped 200,000, and exports touched 100,000. By 1964, Bluebird was being built at 10,000 cars a month. For 1966, Datsun debuted the 1000, allowing owners of 360 cc (22 cu in) kei cars to move up to something bigger. That same year, Datsun won the East African Safari Rally and merged with Prince Motors, giving the company the Skyline model range, as well as a test track at Murayama. The company introduced the Bluebird 510 in 1967. This was followed in 1968 with the iconic 240Z, which proved affordable sports cars could be built and sold profitably: it was soon the world's #1-selling sports car. It relied on an engine based on the Bluebird and used Bluebird suspension components. It would go on to two outright wins in the East African Rally. Nissan began importing Datsun-badged cars to the United Kingdom during the mid 1960s, at which time foreign cars were a rarity, with only a small percentage of cars being imported - some of the most popular examples at the time including the Renault 4 from France and Volkswagen Beetle from West Germany. The first European market that Nissan had entered was Finland, where sales began in 1962. Within three years, it was importing cars to most of Western Europe. Datsun was particularly successful on the British market. It sold just over 6,000 cars there as late as 1971, but its sales surged to more than 30,000 the following year and continued to climb over the next few years, with well-priced products including the Cherry 100A and Sunny 120Y proving particularly popular, at a time when the British motor industry was plagued by strikes and British Leyland in particular was gaining a reputation for building cars which had major issues with build quality and reliability. During the 1970s and early 1980s, Nissan frequently enjoyed the largest market share in Britain of any foreign carmaker. By the early 1980s, the Nissan badge was gradually appearing on Datsun-badged cars, and eventually the Datsun branding was phased out, the final new car with a Datsun badge being the Micra supermini, launched in Britain from June 1983.The Datsun branding was finally discontinued in Britain during 1984 and completely disappeared two years later. In Japan, there appears to have been what probably constituted a long held 'official' company bias against use of the name "Datsun". At the time, Kawamata was a veteran of Nissan, in the last year of his presidency, a powerful figure whose experience in the firm exceeded two decades. His rise to its leadership position occurred in 1957 in part because of his handling of the critical Nissan workers' strike that began May 25, 1953, and ran for 100 days. During his tenure as President, Kawamata stated that he "regretted that his company did not imprint its corporate name on cars, the way Toyota does. 'Looking back, we wish we had started using Nissan on all of our cars,' he says. 'But Datsun was a pet name for the cars when we started exporting.'" Ultimately, the decision was made to stop using the brand name Datsun worldwide, in order to strengthen the company name Nissan. "The decision to change the name Datsun to Nissan in the U.S. was announced in the autumn (September/October) of 1981. The rationale was that the name change would help the pursuit of a global strategy. A single name worldwide would increase the possibility that advertising campaigns, brochures, and promotional materials could be used across countries and simplify product design and manufacturing. Further, potential buyers would be exposed to the name and product when traveling to other countries. Industry observers, however, speculated that the most important motivation was that a name change would help Nissan market stocks and bonds in the U.S. They also presumed substantial ego involvement, since the absence of the Nissan name in the U.S. surely rankled Nissan executives who had seen Toyota and Honda become household words." Ultimately, the name change campaign lasted for a three-year period from 1982 to 1984 – Datsun badged vehicles had been progressively fitted with small "Nissan" and "Datsun by Nissan" badges from the late 1970s onward until the Nissan name was given prominence in 1983 – although in some export markets vehicles continued to wear both the Datsun and Nissan badges until 1986. In the United Kingdom for example, the Nissan name initially was used as a prefix to the model name, with Datsun still being used as the manufacturer's name (e.g. Datsun-Nissan Micra) from 1982 until 1984. The name change had cost Nissan a figure in the region of US$500 million. Operational costs included the changing of signs at 1,100 Datsun dealerships, and amounted to US$30 million. Another US$200 million were spent during the 1982 to 1986 advertising campaigns, where the "Datsun, We Are Driven!" campaign (which was adopted in late 1977 in the wake of the 1973 oil crisis and subsequent 1979 energy crisis) yielded to "The Name is Nissan" campaign. (The latter campaign was used for some years beyond 1985.) Another US$50 million was spent on Datsun advertisements that were paid for but stopped or never used. Five years after the name change program was over, Datsun still remained more familiar than Nissan. In 2001, Nissan marketed its D22 pick-up model in Japan with the name Datsun. This time however, the use of the brand name was wholly restricted to this one specific model name. Production of this model was between May 2001 and October 2002. On 20 March 2012, it was announced that Nissan would revive the Datsun marque for use in Indonesia, South Africa, India, and Russia. On 15 July 2013, nearly three decades after it was phased out, the Datsun name was formally resurrected as a low-cost car brand for countries including India, Kazakhstan, South Africa, and Russia. Nissan said the brand's reputation for value and reliability would help it gain market share in emerging markets. The Datsun brand was re-launched in New Delhi, India, with the Datsun Go, planned to be on sale in India in early 2014. Datsun models are sold in Indonesia, Russia, India and South Africa since 2014. The brand entered Kazakhstan in 2015, Belarus and Lebanon in 2016. The Datsun Go will be built at the Renault-Nissan plant in Chennai, India. Production is also planned in Russia and Indonesia. The Go is based on the same Nissan V platform as the Nissan Micra. The Go+, a minivan, was added to the range in September 2013. In February 2014 the Redi-Go concept car was presented. It is expected that the Redi-Go Crossover will hit the Indian shores by the mid of 2015. In April 2014, the first model for the Russian market, the Datsun on-Do based on Lada Granta, was launched. ↑ Georgano, G.N., ed. (1973). The Complete Encyclopedia of Motorcars 1885 to the Present (Second ed.). Dutton. ISBN 9780525083511. ↑ Madeley, Christopher (July 2005). "Kwaishinsha, DAT, Nissan and the British Motor Vehicle Industry" (PDF). p. 19. Retrieved 16 June 2015. ↑ Togo, Ken (19 February 2007). "Infant Industry Policy: A Case of Japanese Automobile Industry Before 1945". p. 11. Retrieved 16 June 2015. ↑ Madeley, Christopher (July 2005). "Kwaishinsha, DAT, Nissan and the British Motor Vehicle Industry" (PDF). p. 20. Retrieved 16 June 2015. ↑ Nissan Archived January 12, 2009, at the Wayback Machine. 1 2 3 "Datsun Model 11 Phaeton". JSAE. Retrieved 16 June 2015. ↑ Nissan Heritage Archived January 12, 2009, at the Wayback Machine. 1 2 3 4 5 6 7 Daniels, p.495. ↑ Webster, Mark (2002). Assembly: New Zealand Car Production 1921–98. Birkenhead, Auckland, New Zealand: Reed. p. 78. ISBN 9780790008462. ↑ Halberstam, David (1994). The Reckoning. HarperCollins. ISBN 9780380721474. ↑ “Yutaka Katayama; A Man Who Realized a Dream in America", 1998 Z Car Club Association, pg 71. 1 2 3 4 5 6 7 8 Daniels, p.496. ↑ “Yutaka Katayama; A Man Who Realized a Dream in America", 1998 Z Car Club Association, pg 36. ↑ Business Week, April 7, 1973, interview with Katsuji Kawamata, president of Nissan Motor Company Ltd.
↑ Business Week, April 7, 1973, pg. 69. ↑ "日産：ダットサン トラック TRUCK". History.nissan.co.jp. Retrieved 2010-08-12. ↑ "India bound Datsun will also head to South Africa by 2014". 2013-02-28. Retrieved 2013-02-28. ↑ Dawson, Chester (1 October 2012). "For Datsun Revival, Nissan Gambles on $3,000 Model". The Wall Street Journal Online. Retrieved 16 June 2015. ↑ "Nissan on the GO with Datsun". The Hindu. July 15, 2013. ↑ Ashish K Mishra (Jul 8, 2013). "Nissan's Indian Gamble with Datsun". Forbes. ↑ Alexander Parker (2013-02-22). "Nissan to launch Datsun brand in South Africa". Business Day (South Africa). ↑ "Datsun Vehicles Are Sold In Kazakhstan". Wroom.ru. 23 December 2015. Retrieved 29 February 2016. ↑ "Datsun entered Belarusian market". Wroom.ru. 25 February 2016. Retrieved 29 February 2016. ↑ "Sales Of Datsun Cars Began In Lebanon". Wroom.ru. 15 July 2016. Retrieved 15 July 2016. ↑ "Nissan revives Datsun brand with Go hatchback". Automotive News. July 15, 2013. Retrieved July 18, 2013. 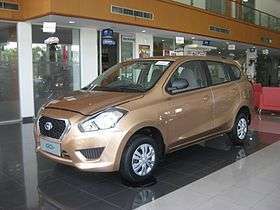 ↑ "Datsun GO+: Datsun's second model is an MPV". Paultan.org. 17 September 2013. Retrieved 17 September 2013. ↑ "Auto Expo 2014: Datsun redi-GO concept shown". Autocar India. 5 February 2014. Retrieved 8 November 2014. ↑ "Datsun Redi-Go based micro crossover launch likely in 2016". CarTrade. 20 January 2014. Archived from the original on 20 January 2015. Retrieved 20 January 2014. ↑ "Datsun ready for Russia" (Press release). Datsun. 4 April 2014. Retrieved 16 June 2015. Daniels, Jeff. "Datsun: Powerful Challenger from the East", in Northey, Tom, ed. World of Automobiles, Volume 5, pp. 495–497. London: Orbis, 1974. Wikimedia Commons has media related to Datsun vehicles.